Newton, Kansas - History - Oats & Hay Bottling Co.
Mrs. Carl (Ethel) Hay talks about living in Newton. She also discusses her husband's ice cream business (with Eskimo Pies) and raising her family in Newton, KS. 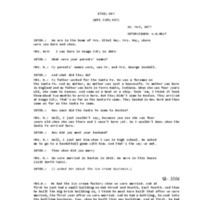 Newton Public Library, Newton Kansas, “Ethel Hay Interview,” Digital Newton, Kansas, accessed April 22, 2019, https://newton.digitalsckls.info/item/761. were you born and when. INTER. :	What were your parents' names? MRS. H.:	My parents' names were, was Mr. and Mrs. George Kendall. INTER. :	And what did they do? the Santa Fe. And my mother, my mother was just a housewife. My mother was born in England and my father was born in Terre Haute, Indiana. When she was four years old, she came to Kansas. And came on a boat or a ship. Took 'em, I think it took them about two months to arrive here. But they didn't come to Newton. They arrived at Osage City. That's as far as the Santa Fe came. They landed in New York and then came as far as the Santa Fe came. INTER. :	How soon did the Santa Fe come to Newton? years old when she was there and I wasn't born yet. So I wouldn't know when the Santa Fe arrived here. INTER. :	How did you meet your husband? me to go to a basketball game with him. And that's the way we met. "Oats and Hay make good ice cream." And the people that came in on the Santa Fe, see it was right across the depot, and when the people came in on the Santa Fe they’d see the"0ats and Hay makes good ice cream." And, "Well how in the world can you make good ice cream from oats and hay?" That’s what some of them would remark. And then his partner moved to California, I think, soon after we were married, the first year, I think, and he sold out to my husband. No, he sold it (her husband sold the franchise) in 1929, just before the crash you know. He didn't want to sell it. He was too young to retire. But these people wanted it because they thought it was, you know, wonderfu1 business. And he didn't have any competition when he was first in business. And he had, every store in Newton bought from him, you know, drugstores and restaurants and all those. And, but he, so he really didn't want to sell. But they insisted. It was some fellows from Salina. And they bought all little ice cream places. Several in Kansas. And then after the crash hit, why it kept going down and it finally they had to give up. So he was really fortunate to have sold out. INTER. :	How did the franchise for the Eskimo Pies come about? three little boys. These Eskimo Pies went over so big, but I really didn't pay much attention and I can't - I've tried to find some history, but I couldn't find it. INTER. :	Well, how did they make them? an ice cream maker, he made lots of molds, you know and different things. I know Christmas, we couldn't have any dessert but an ice cream Santa Claus. For years, that's all we had. They were really pretty. And, but we just had to have that. And we always had to have ice cream for dessert, some kind of fancy ice cream because that was his business. Well then, he made the Eskimo Pies. He took a little stick and made a square or oblong and he'd freeze that, freeze the stick in there like a sucker or something, you know. And then that would be hard. And then he had a little, a like machine, I called it, but it looked like a spinning wheel. And the wheel went around and turned the syrup, this chocolate in there. And then he had a girl who worked in the factory. She dipped those, after they'd been frozen. She dipped them and then they'd put them back in the freezer and freeze the chocolate part on there. You've? they, his father was a bridge builder, before he, and a farmer. Harvey County engineer. And he did all his own book work in the Harvey, up in the Courthouse and of course he had his office up there. And he didn't have any stenographer or any secretary. And he really did a lot of the work out, well, of course he was an overseer, but he did a lot of work, too. And now they, I think they have twenty employees or something he didn't have any! That was, of course there wasn't so many people and there wasn't so many bridges, you know, and there wasn't so much pavement. The Hays when they moved from the country, my husband was ten years old when they moved in town. He was born on Tenth Street. And then they moved out in the country. They lived on Tenth Street two years. And then, when he was ten, they moved back to town. And they bought a house on this corner, where Mid-Continent is. And there wasn't, this Main Street bridge wasn't here then. And you had to turn at Twelve and go across Twelfth Street bridge and then down along the creek and then back again to get on Main, see? But there was a road. That was the way, but it, none of it was paved. And there was a street, there was a house right in the middle of the street. INTER. :	It just kind of dipped? MRS. H.:	Yes. But it was in the middle of the street, the house was. And a doctor lived there. I forget his name. They were young, must have been young then. I know there was one house back here that, her name was Miss Ainesworth. Her folks homesteaded that place, and they had to go past there and then down along the creek to get back on Main, see? See, they'd crossed the creek there, then they'd get back on Main, and go on out. Cobble and --they have a ranch up by Cedar Point. They still have it. But they're trying to make it into a lake. And their son he's been to Washington four times to fight it, so I don't know how it's coming out. in this block. And not many, it wasn't paved. When I came, the streetcar was here. Interurban, they called it. Came from Wichita and run out to Bethel and back. It was seventy five cents or a dollar, I don't know now. MRS. H.: Well, not too long. I imagine maybe an hour. You can go faster now. Let's see, I must have been 16 or 18 when that Interurban first came to town. And we, the fellow that run the, oh he was good looking! So all we girls would try to get a ride to look at him. INTER. :	How long was it here before, when did they retire it? see, when we first came to Newton, there wasn't any cars. Only a few. Now there was a few cars, you know, those electric ones and a few rich people had cars. INTER. :	So, most everybody used the streetcar or they walked, huh? MRS. H.:	Well, if we wanted to go to Bethel or Wichita. MRS. H.: Just run up this street. Come in Fifth and just ran up here by-- you couldn't go on any other streets. But anyway, we were used to walking. 'Cause we'd always walked. We used to walk to Bethel and not think a thing about it. People fuss about it. Going to school now, they all have to have a car. And I lived on Fifth Street, and we would go to, I was in the eighth grade then, and we'd go over to Southside, that's the only, there was three grades over there, just three eighth grades. We had to walk clear over there. All the kids in town had to go there, for that school is on First Street now. That's where we went to eighth grade. And we'd all walk. No matter where you lived, you walked. And we'd walk home for lunch. Oh these kids, oh they'd die now if they had to do that. was born in 1928 and Kendall was born in 1933- And the boys was raised here in Newton, went to high school, and Jack went to Wentworth Military Academy for two years. And then the Army took him to Africa first and then to Rome, or to Italy in the war, the Second World War. And then Keith went to K.U., graduated from Kansas University. Then he went to Ft. Collins, Colorado, and received his Masters degree in conservation and wildlife. Then Kendall went to K.U. and graduated and then he got his Master's degree at K.U. Kendall is in Wellington, Kansas. He's assistant superintendent at Wellington. When we came to Newton I think it was in 1905, we came to Newton, we lived on East Sixth Street. And we lived the second door from Erma Suderman. And she and I have always been friends, ever since we arrived in Newton. And we went to high school together. And then Theresa Conkey went to school with us, but she lived out on Highway 50. And I think they are the only two that I can remember. But I know, they were the first ones in Newton that were my friends. Theresa passed away in February of this year. She never had any children. Erma had one son. And he's in California. She married Bert Stuart. He was a teacher here a long time in the high school. Fe when he got to Newton. Do you remember the roundhouse? The next year he (Kendall) he had to go to kindergarten, he had to go to Cooper. And it was only two blocks or something there and he said, "No, I 'm not going, I 'm not going I'm going to wait. I get up in junior high and then I'm going across the street. We lived across the street, from the junior high. MRS. H.:	They say some of the cutest things, don't they! INTER. :	Yeah, they do, their thoughts are really interesting. storms are different. Because I know we used to have cyclones. We used to have cyclone caves and we'd have to run to those caves. And we had one here on this place back here. But now, I know we went to Florida in the winters, my husband and I for six years after our boys had married. And we were down there one time, and a lady asked me where I was from, and she said Kansas. And she said, "Oh that terrible state!" And I said, "What's the matter with it?" And she said, "Oh, it has cyclones and tornadoes and they're terrible." And ! said, "Well you have all these old hurricanes that wash you away." And she said, "But we have warnings." And 1 said, "So do we." You can read in the paper where Florida has cyclones, one right after another, can't understand it. It's just changing all over the country. INTER. : What did you do for entertainment when the boys were growing up, usually? the ball games. They had little ball games. And they played with the neighbor children and they, they would, my boys seemed like they could entertain their selves. They didn't have to be entertained. But we didn't have any T.V. 's or radios. INTER. :	When you were growing up. MRS. H.:	And so, we didn't have colored T.V. till my boys were grown. to Johnny's or some place. They have to be entertained. But our boys seemed to find entertainment at home and we'd--Sleigh riding, when I'd, and you know and had a lot of fun with the horses, but now when my, I know when Jack was four years old he, he would sit on the front porch and wait for the garbage man to come 'cause he drove a horse. And oh, he was just so interested in that horse. I don't know his name in McPherson or Salina or some place. But anyway, then the other drugstore belonged to Mr. Smith. Mr. Smith run it years ago. And now it's changed hands twice. And Wilson's had it and now, now I can't tell you the name of the people who have it. Yes, they were both pharmacists. All the Reeses were. Then, Anderson's Bookstore is an old store. And the Anderson family. They had, down by the Santa Fe depot, their store was, their first store. INTER. :	I hadn't read that. before the, I don't know whether it was there before Main Street was paved. Of course, Main Street was paved when I came. But that store was there. And their son Phillip took it over. And, he had two sons, Phillip and I can't think of this other son's name. But he moved to Washington or somewhere. And the mother, their mother used to help, but their father died, and their mother used to help in there. And then, I can't think when he moved, when they built the new Santa Fe depot, he moved. Because they tore those buildings down. He moved up on the corner where Anderson's Bookstore is. And now Phillip 11 runs it now and there's a Phillip III. His son works with him. I went to high school you know and in the summer I would--you know they sold school books. MRS. H. When they'd have the rush and all that, why, I worked in there some, and they never had any, the ice cream thing was gone. But this was still down there at the depot. for 'em were so, were always dressed alike and always you know, so just like waitresses. But he had to have he must have had to have different cooks. You know you can't keep the same cooks. They die or get hurt or something. Oh it was, and not only here, not only here, in Albuquerque it was just the same. Wherever he had a place it was just run like a………..